A resource for schools and colleges devised by JA-YE Norway, Creative Cards consists of a set of 54 cards which contain a range of ideas and exercises focusing on problem-solving and offering inspiration for collaboration and creative thinking. 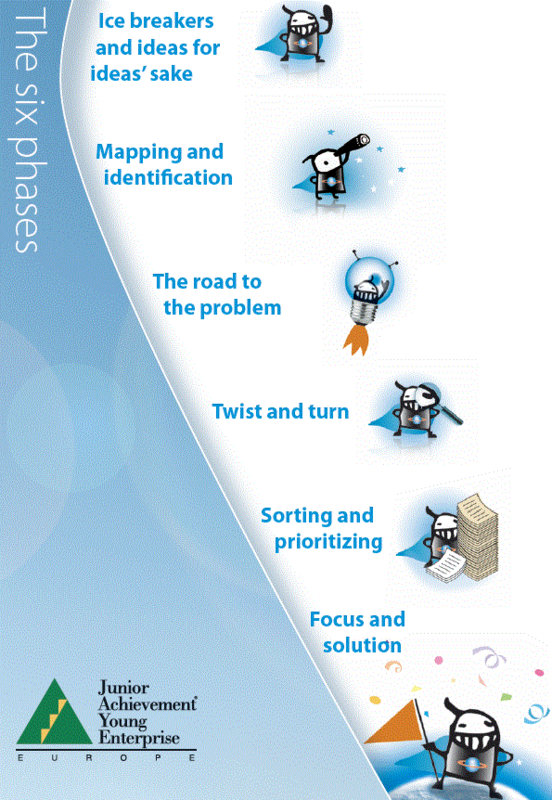 Card 2 illustrates the process called 'The Creative Working Model' where the first stage is about developing creative teams, the second stage is to identify problems, and then to reach a common understanding, before finding one solution from many, which can be implemented. Each card contains a description of a step-by-step exercise, and an indication of the time needed to complete it. Learn the basics of project management and how to deal with difficult tasks by dividing them up into smaller parts. In timed activities, it might be useful to have a stopwatch available or to appoint a timekeeper in every group. The cards are very well explained and structured, containing creative activities to entice problem solving and innovation skills, helping students to think out of the box, while providing teamwork and flexibility skills, One of the hardest things for a teacher to manage to get students to do is to brainstorm, as when we say brainstorm it is too vague for students. These cards help students develop techniques to mindmap and identify problems in greater depth, recylce failure and find alternative solutions. These cards will be very helpful in our teacher training sessions as well as in our starting sessions of the innovation camps we organize. We will have to translate them in to dutch though. Thx to JA-YE Norway!!! I think it is a very helpful tool for trainers to use before starting a school entrepreneurial project or while trying to identify a problem and creatively thinking for a solution/product to address the specific need. It would be a wonderful combination with the Company Program of JA that we run at our school in Greece. This material can be used in the learning process very often.It helps develop thinking, intellect and creativity. very well describe the methods that will be useful to everyone from educators to work at the beginning of the school year and during the training. Wundervolle Karten, schön konzipiert gut nachvollziehbar. Hilfreich sind die Zeitangaben. Gut wäre es, die Karten in die einzelnen Landessprachen zu übersetzen. A great collection of ideas that can be crucial to getting started. Many teachers calls for concrete proposals for implementation. Here, they get it! Great! An innovative and useful resource which can be used at different age levels. This resource is useful in that it encourages creative thinking , whilst learning that working collaboratively . Also lots of fun to be had . This seems like a tool which can help in many different ways and in many different age groups. It will also allow groups to get to know each other. This excellent resource tool can be used as a very useful, inspiring and helpful "guide" throughout the whole long-term process of a students' business company. The teacher performing as "coach" has a number of effective concrete devices that can be used at differents steps of the business activity. Therefore -> highly recommendable. Great cards for any type of school and for supporting creativity of every child. Everything is explained clearly and that is why it is very helpful for teachers to be begin their creative journey. The creative cards can be use for all ages and levels. I think it is very helpful tool for trainers to use for developing creativity, problem solving skills and cooperation. At this moment we use energizers in our workshops for teachers. It's not new for me, but the cards are very clearly and ready to use. I think this method is very complex. It can be applied to my tenth grade students. It's use in the design business plan is welcome. I can't wait to put it into practice! Using creative cards is entertaining, interactive, and students are challenged to think strategically. It is also important for the personal development of students. A great idea, congratulations! What a exelent toolbox for a techer. Very helpful tool and easy way to start. So many different activity to do. Good tasks - no matter age. I have used «make an elephant» on students and colleagues. Effective ice breaker. Starts creative thinking. Practicing communication skills and respect for each other. Very good tool to find new ideas and to think out of the box. I recognise these cards recently and haven't used them yet. But I will use them next year for sure. A great tool, both for students and teachers. It can be easily applied to a wide range of students, from elementary to high school level. Helpful for organizing your thoughts, and present the reasoning to other audience as well! I guess it will be creative also for teachers' training. Ideal tool for JA Company program and Innovation camps. It seems a very good tool to try it in schools: it focuses the ability of thinking outside the box, brainstorming, team work and so on. Very good! It looks like a very good tool for teacher to work with students. Cards look wel structured and explained - activity itself forces students to work in groups, think and solve problems. I believe teachers will really appreciate it. Awesome !!! I think it's easy to use and has a great chance to increase decision-making skills for pupils, students and teachers, too. Creativity cards is a great tool that we have tested in many students and teachers events. Well structured and easy to use - each user can choose a particular activity that will fit exactly to the purpose of the session.